Why, you might well ask... well. I just fancied painting it, to be honest. I wanted to try to give it a little bit of life, and also to attempt a little Trompe L'oeil (Fancy pants painting that looks 'real'). So there you go. 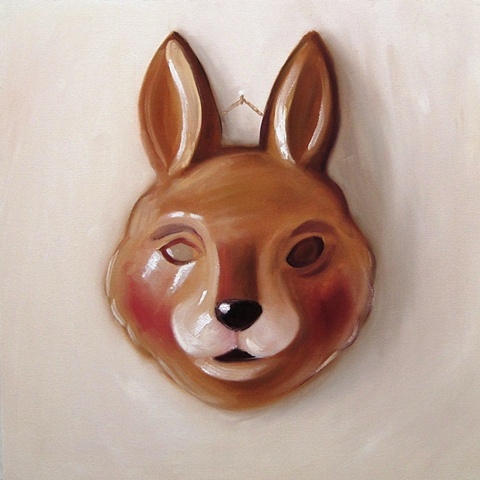 A painting of a rabbit mask. A rabbit mask that also looks a bit like a fox mask. (It said rabbit on the label, so we're sticking with rabbit). This painting has sold... but if you want a painting of a rabbit mask, or, if you want a painting of a fox mask, Click Here. If you want to get the hell away from the masks, Click Here.